The Jesuit priest is lashed to a wooden cross and pushed into the river; he drifts downstream, face upturned to the sky, knowing in a few minutes he will see it no longer. The currents take hold, swirling the cross around in the churning water as it picks up speed, hurtling toward an unseen roar. In an instant, the priest is at the mouth of the Devil’s Throat, Garganta del Diablo, and is swiftly plunged headfirst down its terrifying mouth into an oblivion of thunder and spray. I stare at the tumbling, cataclysmic wall of water, the image of the crucifix and priest’s descent into the boiling fury beneath me, frozen in time on the face of the falls. I wonder: how long would it take to die in that? I’m shaken from my reverie by people shouting, trying to make themselves heard over the falls’ cacophony. A forest of selfie sticks and smartphones is crowding around me on the lookout platform, lifting me out of my daydream of long ago, when Iguazú Falls was the front line in a fight between good and evil. The martyrdom of a priest, the opening scene of Roland Joffé’s 1986 film, The Mission, is filmed at Iguazú Falls. Much of the story of Spanish Jesuit priests’ efforts to keep native Guarani Indian tribespeople out of the clutches of Portuguese slave traders takes place here. I walked from the cinema vowing to one day see the place where Robert De Niro and Jeremy Irons battled the Portuguese and everything Iguazú threw at them. 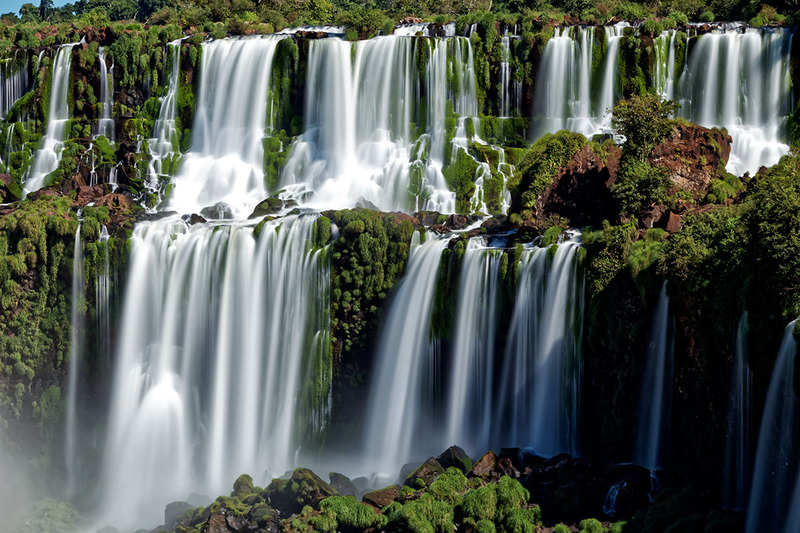 The Three Muskateers Falls at Iguazú Falls, and the Rivadavia Falls on the Argentine side. Thirty years later, I’m here at last. The last coach has left, and the throngs of smartphone-wielding tourists clogging lookouts have finally departed Brazil’s Iguaçu National Park. (The spelling changes depending on whether you’re on the side of the park that speaks Spanish or Portuguese.) The falls are now ours—exclusive to my wife and me, and the other paying guests of the beautiful and expensive Belmond Hotel das Cataratas. Sadly, we can only afford one night here. 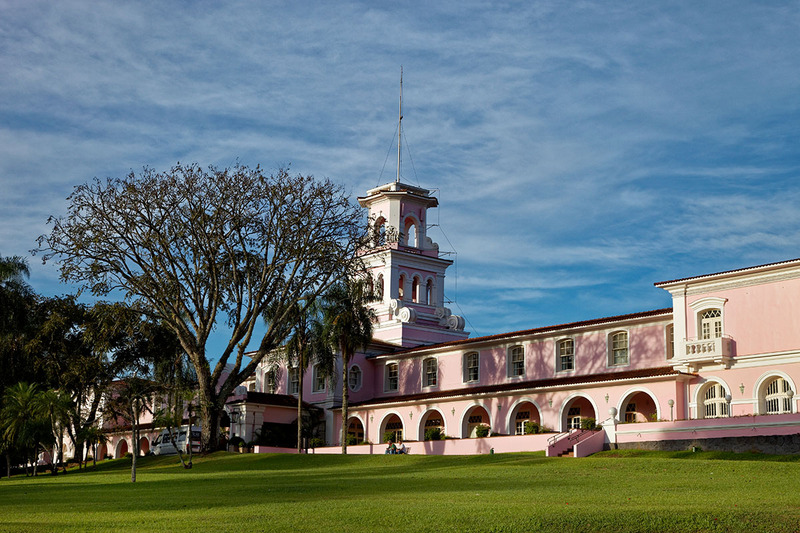 The sole reason for splashing out on the pink colonial-style structure—the only hotel in the park—is to have the falls to ourselves. As hotel guests, we have sole access to the park from 5 p.m. until 9 a.m., until the hordes return. If you want to see the falls without the crowds, this is the only way to do it. The anticipation of leisurely exploring the pathways and lookouts in peace on a subtropical evening takes the sting out of the bill we must pay tomorrow. From where the coaches disgorge their daytime cargo beneath the hotel, the first view of the falls is remarkable: a crescent curtain of cataracts running along the Argentine side of the Iguazú River (“great water”), which stretches almost three kilometres, comprising 275 different waterfalls that plummet as far as 82 metres deep, at a heart-skipping rate of up to 450,000 cubic feet a second in the rainy season. The Belmond Das Cataratas Hotel, the only hotel on Brazil’s side of the falls. The first European to discover the falls was the Spanish explorer Álvar Núñez Cabeza de Vaca in 1541, and Jesuit missions were established at the beginning of the 17th century, the inspiration for Joffé’s film. Today, the Iguazú River forms the border between Brazil and Argentina and both countries have constituted national parks around the falls, with each park being designated World Heritage Status in the 1980s. We begin our exclusive exploration along the path above the lower river through subtropical rainforest: butterflies flit, birds flock in trees, insects and cicadas sing against a backdrop of rumbling thunder coming from the waterfalls. We are in an incredibly rich area of biodiversity: some 2,000 plant species, 400 species of birds and around 80 mammals. From a lookout by a group of waterfalls called “The Three Musketeers,” we watch one of the most popular activities in the park: two orange zodiac boats edging as close to their base as possible, soaking passengers in waterproof ponchos. 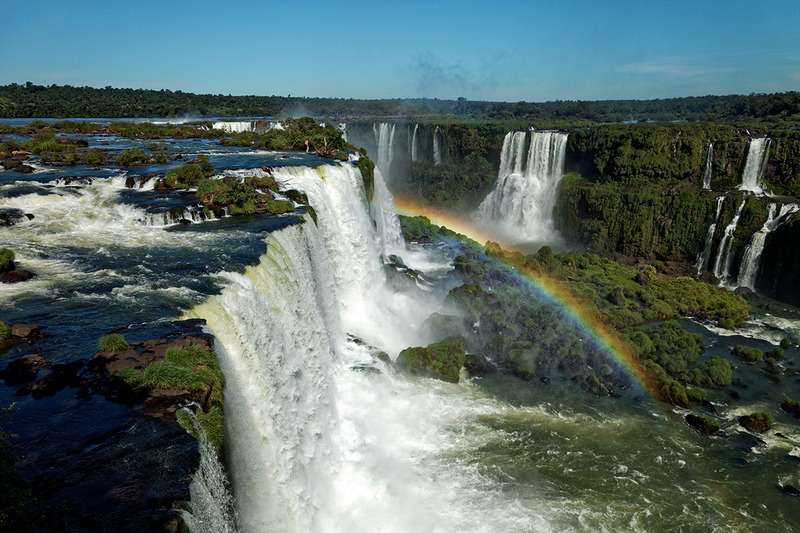 It’s not uncommon to see rainbows bursting out from Iguazú Falls. At the end of the pathway we reach one of the most photographed walkways and viewing platforms in either park sitting at the base of a broad and mighty cataract called Floriano Falls. Through the mist, over water running around boulders covered in tufts of green grass like bad haircuts, we reach the lookout. It hangs above the edge of a cliff. The Santa Maria Falls plunge beneath us to the churning river below. Looking up the canyon to our left, past thundering cascades on both sides, is the vortex of the Devil’s Throat, almost hidden behind a wall of spray . The noise here is intense, the view breathtaking, and we get very wet. Looking out at the Devil’s Throat, from a vantage point at the Santa Maria Falls. At the base of Floriano Falls a series of three viewing platforms has been built on different levels. The lower two platforms get us right up close to the edge of Floriano Falls, so close that behind the curtain of water we can make out great dusky swifts resting on the cliff face. At dawn, we see swarms of these birds swoop after insects, diving between torrents of water. We take an elevator with a glass window up to the third level, high above Floriano Falls, affording spectacular views over the canyon and the Devil’s Throat. 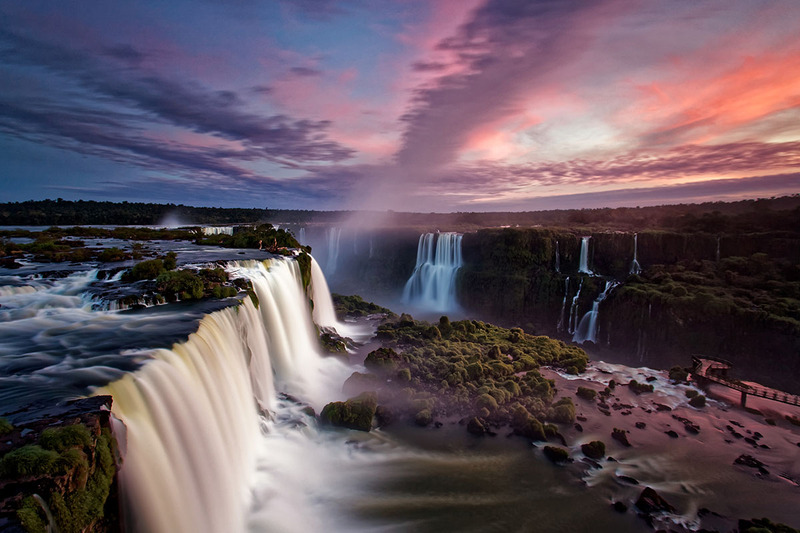 At dusk the sky turns purple and pink, and the face of the falls is tinged with colour. The park is quiet, empty of people, the cicadas are asleep, but the thunder never ceases. 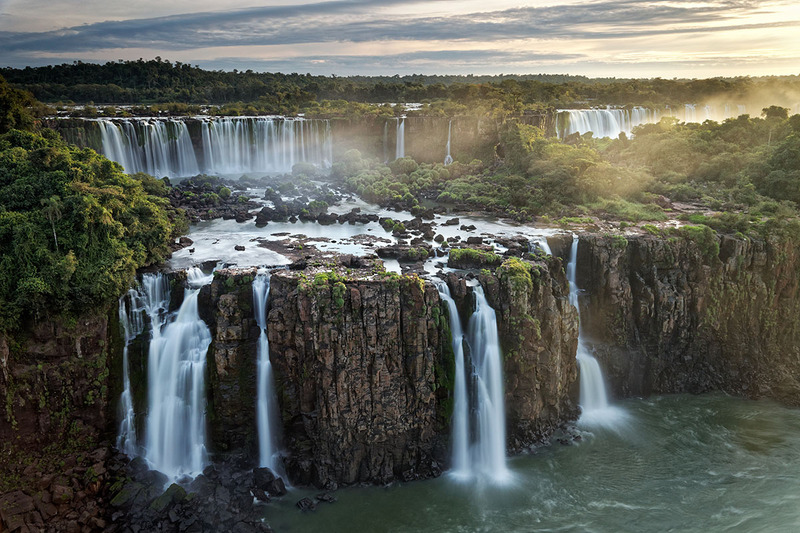 Brazil may offer a more relaxed viewing experience, but Argentina offers close-up thrills, more trails and more crowds. 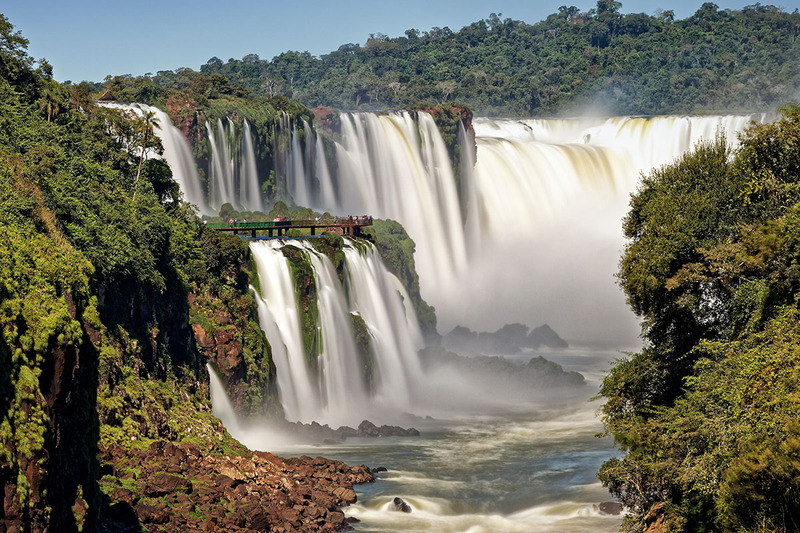 On the Argentinian side, a light railway with open carriages shuttles the masses from near the park entrance to Garganta del Diablo Station—Devil’s Throat Station—above the head of the falls. At Cataratas Station, the second stop, there is a café. We find customers there being harassed by coatis, large, rather cute-looking rodents with long snouts and stripy tails who hunt in packs. They leap onto tables to snitch chips. You have to be alert. They can bite, and there are signs telling us not to feed them. Café staff try to chase them off with a plastic bottle tied to a broom handle. It’s a futile task. 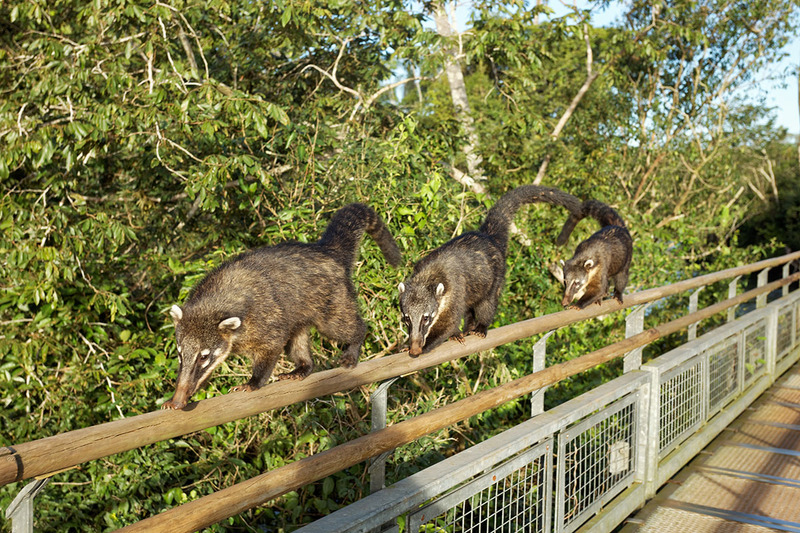 Coatis scamper around the walkway to the Devil’s Throat. There’s a throng queuing for the last train to the Devil’s Throat, which we join, disembarking 10 minutes later at the river edge above the falls. A walkway winds over the expanse of water for one kilometre, past islands covered in trees in which birds roost. We spy a toucan, its beak glowing orange in the afternoon sun and, below us, an enormous fish hovers stationary in the current. The Garganta del Diablo has been described as an ocean plunging into an abyss, and that’s pretty accurate. A large section of the Iguazú River simply disappears into a large semicircular chasm in a crescendo of noise and mist that rises 150 metres into the air. The lookout platform lets us peer over the edge of the abyss. Dozens of waterfalls cascade all the way down the canyon, erupting in sparkles and rainbows in the late afternoon sunshine. The spectacle is intoxicating. Looking at the Brazilian side of Iguazú Falls, with the Devil’s Throat roaring in the distance. The next morning, we are back at the park at 10 a.m. It’s a weekend, not a cloud in the sky, and the crowds are here in their thousands. We opt for the upper trail first and run into a traffic jam of humanity blocking the narrow pathways at every turn. On this path, the viewpoints run directly above the waterfalls, so the view are uniquely straight down the face of the falls. We manage to escape the crowds and begin the longer, lower circuit. It’s a fascinating walk, as you get a greater sense of scale and force of the water from below. By Bossetti Falls, a beautiful and powerful cataract, we stand right at its base, blasted by spray, surrounded by selfie sticks. 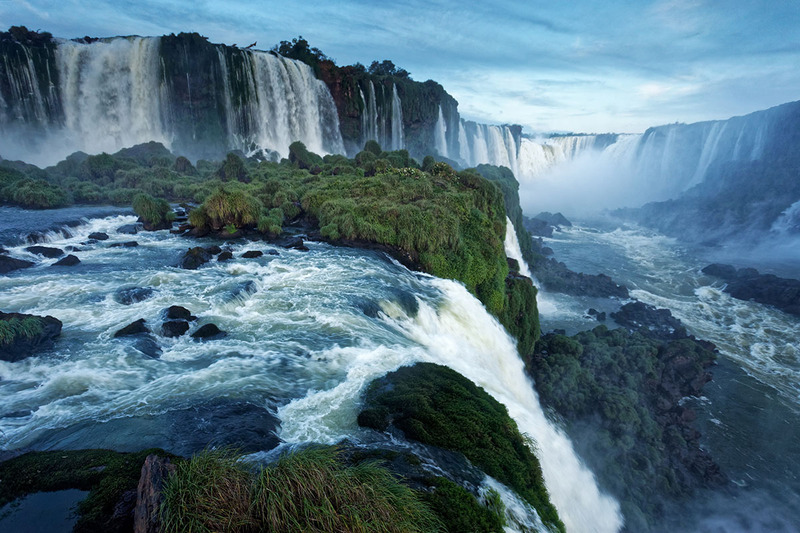 The Adam and Eve Falls on the Argentinian side of Iguazú. At a café near the Sheraton Hotel we find gangs of coatis causing chaos. The animals have no fear at all, and their antics are causing great amusement. On one pathway, we see another posse of coatis trying to attack a small child in a pushchair who is holding a snack. He’s chased off by the parents, but it could have been nasty. We cannot resist another train ride and walk to the Devil’s Throat, marvelling at its power and our good fortune to be here. On the way back, we opt out of the train journey and take a ride back along the Iguazú River in a zodiac rowed sedately by a guide who points out birdlife, caiman and turtles. Here, well away from the falls, the river at sunset is still and peaceful, the extravagant vegetation reflected in the golden water like a mirror. Even the waterfalls are silent. Flying time from Buenos Aires to Puerto Iguazú is an hour and 50 minutes; from São Paolo to Foz do Iguaçu it’s an hour and 40 minutes. The falls are almost entirely responsible for huge growth in both towns, so there’s a great number of accommodation and eating options on both sides of the border. The Belmond Hotel das Cataratas in Brazil and Sheraton Iguazú Resort & Spa in Argentina are the only hotels in either park, and both allow guests access to the falls outside of opening hours. If they are in your budget, these are the only ways to experience the wonder of Iguazu Falls in solitude. Otherwise, bus services from both towns are easy and inexpensive. Mark Meredith is a British writer and photographer living in Auckland, New Zealand, happy to have moved to what is probably the world’s most beautiful country. To celebrate his 10th anniversary of arriving down under, he has published an interactive photo travel guide to the Auckland region called 10 Years A Kiwi, available from Apple’s iBook Store.